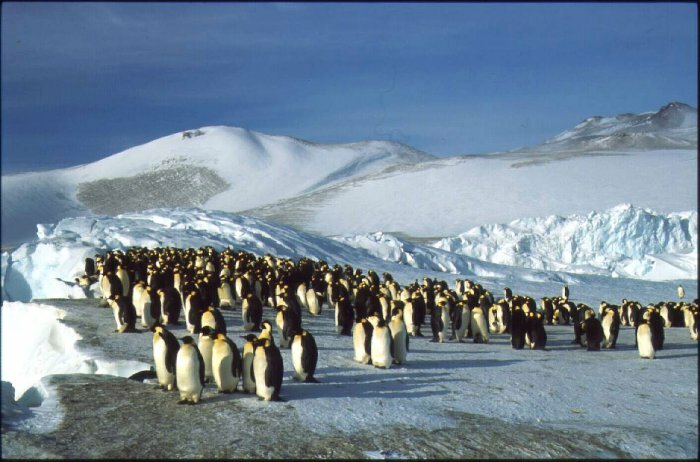 A group of emperor penguins photographed at Cape Crozier. and snowstorm are intensivating. Large parts of the seasurface changes to an icecap. 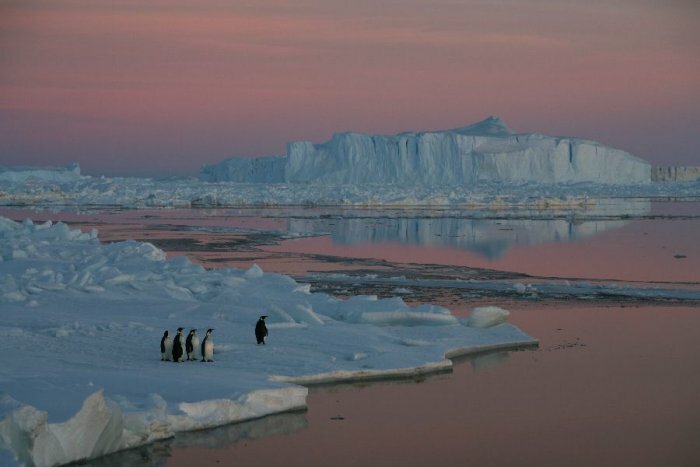 Almost all the birds that has been here during the antarctic summer, now find their way north. Only on bird does the oppsite. It moves south, into the interior of this cold place. 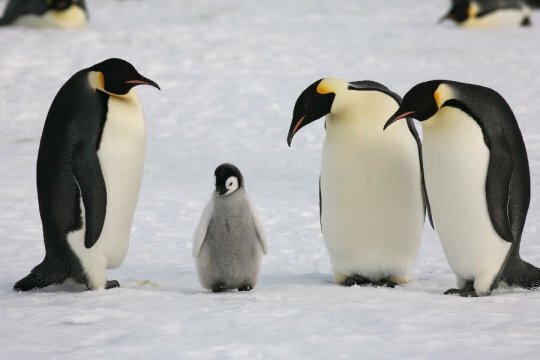 That is the Emperor Penguin, the largest, tallest and most beautiful of all the penguins. It is easily distinguished from the others by the yellow spot on its neck and chest. 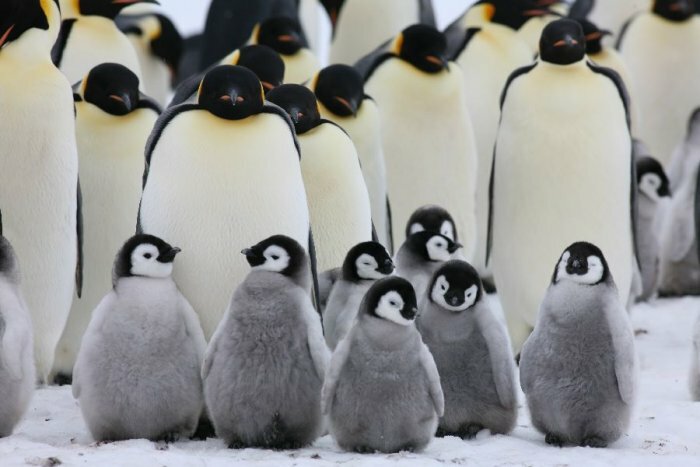 As many Emperor penguins now get closer to their breeding places, they join in larger groups. Like military columns they march together toward their goal, where they reach in March and April. 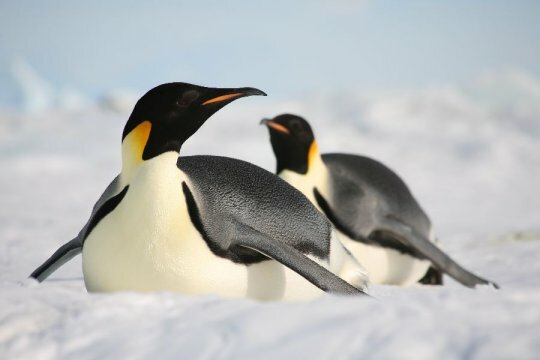 However, it is still uncertain if male and female meets again since last year, likewise the Adelie Penguins. The eggs are being laid in May or June. The male starts taking care of it, placing it between his feet. The female soon looses interest, and leaves tghe place and joins the other female penguins and start marching back into the sea. been covered with ice much longer out into the ocean. against minus 40 degrees and snowstorm with windforces up to 145 km/hour, it is not a very pleasant job. Also, remember, in this long period the male is without any food! Some times it happens that the female comes back after the chick has been born. How to feed it then? 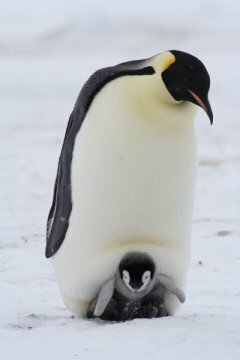 A remarkable thing about this penguin is that it is able to gulp up something like milk, which it gives to the chicken. That will help keeping it aliver for a few more days. 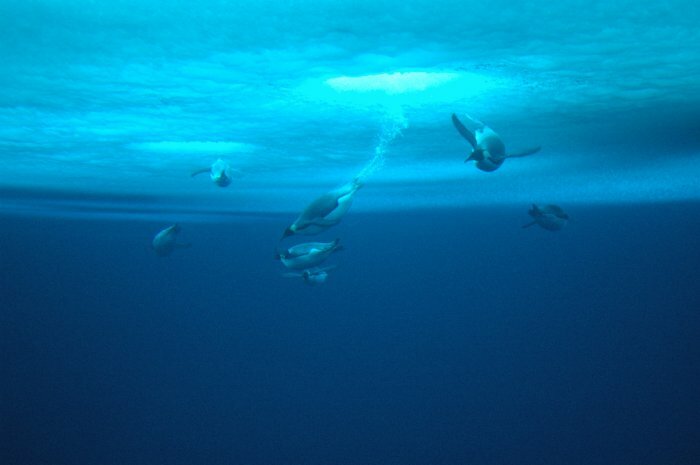 Emperor penguins dive beneath the dive holes at the Penguin Ranch in Antarctica. So the female returns and they change place. Now the male goes to sea and stay away for another few weeks. is abandoned, and the remaining partner has to leave also, to get food soon again.